In this step-by-step Seaborn tutorial, you’ll learn how to use one of Python’s most convenient libraries for data visualization. Well, if you’re looking for a simpler way to plot attractive charts, then you’ll love Seaborn. We’ll walk you through everything you need to know to get started, and we’ll use a fun Pokémon dataset (which you can download below). Seaborn provides a high-level interface to Matplotlib, a powerful but sometimes unwieldy Python visualization library. If matplotlib “tries to make easy things easy and hard things possible”, seaborn tries to make a well-defined set of hard things easy too. Using default themes that are aesthetically pleasing. Easily and flexibly displaying distributions. Visualizing information from matrices and DataFrames. Those last three points are why Seaborn is our tool of choice for Exploratory Analysis. It makes it very easy to “get to know” your data quickly and efficiently. 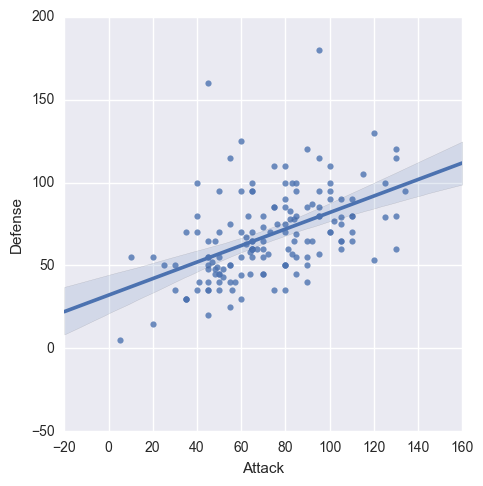 However, Seaborn is a complement, not a substitute, for Matplotlib. There are some tweaks that still require Matplotlib, and we’ll cover how to do that as well. While Seaborn simplifies data visualization in Python, it still has many features. Therefore, the best way to learn Seaborn is to learn by doing. First, understand the basics and paradigms of the library. Each library approaches data visualization differently, so it's important to understand how Seaborn "thinks about" the problem. Then, fire up a dataset for practice. Learning in context is the best way to master a new skill quickly. Finally, refer to galleries to spark ideas and documentation to customize your charts. Since you've already learned the library's paradigms and had some hands-on practice, you'll easily find what you need. This process will give you intuition about what you can do with Seaborn, leaving documentation to serve as further guidance. This is the fastest way to go from zero to proficient. We tried to make this tutorial as streamlined as possible, which means we won’t go into too much detail for any one topic. It’s helpful to have the Seaborn documentation open beside you, in case you want to learn more about a feature. Instead of just showing you how to make a bunch of plots, we’re going to walk through the most important paradigms of the Seaborn library. Along the way, we’ll illustrate each concept with examples. First, things first: Let’s. Get. Pumped. Up! Step 2: Importing libraries and dataset. Next, we'll import Matplotlib, which will help us customize our plots further. Tip: In Jupyter Notebook, you can also include %matplotlib inline to display your plots inside your notebook. Then, we'll import the Seaborn library, which is the star of today's show. Now we're ready to import our dataset. Tip: we gave each of our imported libraries an alias. Later, we can invoke Pandas with pd, Matplotlib with plt, and Seaborn with sns. Once you've downloaded the CSV file, you can import it with Pandas. Tip: The argument index_col=0 simply means we'll treat the first column of the dataset as the ID column. As you can see, we have combat stats data for the original 151 (a.k.a best 151) Pokémon. Step 3: Seaborn's plotting functions. One of Seaborn's greatest strengths is its diversity of plotting functions. For instance, making a scatter plot is just one line of code using the lmplot() function. There are two ways you can do so. The first way (recommended) is to pass your DataFrame to the data= argument, while passing column names to the axes arguments, x= and y=. The second way is to directly pass in Series of data to the axes arguments. By the way, Seaborn doesn't have a dedicated scatter plot function, which is why you see a diagonal line. We actually used Seaborn's function for fitting and plotting a regression line. First, we'll set fit_reg=False to remove the regression line, since we only want a scatter plot. Then, we'll set hue='Stage' to color our points by the Pokémon's evolution stage. This hue argument is very useful because it allows you to express a third dimension of information using color. Step 4: Customizing with Matplotlib. Remember, Seaborn is a high-level interface to Matplotlib. From our experience, Seaborn will get you most of the way there, but you'll sometimes need to bring in Matplotlib. First, invoke your Seaborn plotting function as normal. Then, invoke Matplotlib's customization functions. In this case, we'll use its ylim() and xlim() functions. For more information on Matplotlib's customization functions, check out its documentation. Step 5: The role of Pandas. Even though this is a Seaborn tutorial, Pandas actually plays a very important role. You see, Seaborn's plotting functions benefit from a base DataFrame that's reasonably formatted. We can remove the Total since we have individual stats. We can remove the Stage and Legendary columns because they aren't combat stats. In turns out that this isn't easy to do within Seaborn alone. Instead, it's much simpler to pre-format your DataFrame. It's outside the scope of this tutorial to dive into Pandas, but here's a handy cheat sheet. Another advantage of Seaborn is that it comes with decent style themes right out of the box. The default theme is called 'darkgrid'. Next, we'll change the theme to 'whitegrid' while making a violin plot. Violin plots are useful alternatives to box plots. They show the distribution (through the thickness of the violin) instead of only the summary statistics. As you can see, Dragon types tend to have higher Attack stats than Ghost types, but they also have greater variance. Now, Pokémon fans might find something quite jarring about that plot: The colors are nonsensical. Why is the Grass type colored pink or the Water type colored orange? We must fix this! Fortunately, Seaborn allows us to set custom color palettes. We can simply create an ordered Python list of color hex values. Wonderful. Now we can simply use the palette= argument to recolor our chart. Violin plots are great for visualizing distributions. However, since we only have 151 Pokémon in our dataset, we may want to simply display each point. That's handy, but can't we combine our swarm plot and the violin plot? After all, they display similar information, right? First, we'll make our figure larger using Matplotlib. Then, we'll plot the violin plot. However, we'll set inner=None to remove the bars inside the violins. Next, we'll plot the swarm plot. This time, we'll make the points black so they pop out more. Finally, we'll set a title using Matplotlib. Awesome, now we have a pretty chart that tells us how Attack values are distributed across different Pokémon types. But what it we want to see all of the other stats as well? Step 9: Putting it all together. Well, we could certainly repeat that chart for each stat. But we can also combine the information into one chart... we just have to do some data wrangling with Pandas beforehand. As you can see, all of our stats are in separate columns. Instead, we want to "melt" them into one column. First, the DataFrame to melt. Second, ID variables to keep (Pandas will melt all of the other ones). Finally, a name for the new, melted variable. All 6 of the stat columns have been "melted" into one, and the new Stat column indicates the original stat (HP, Attack, Defense, Sp. Attack, Sp. Defense, or Speed). For example, it's hard to see here, but Bulbasaur now has 6 rows of data. ...you'll find that melted_df has 6 times the number of rows as stats_df. Now we can make a swarm plot with melted_df. But this time, we're going to set x='Stat' and y='value' so our swarms are separated by stat. Then, we'll set hue='Type 1' to color our points by the Pokémon type. Separate points by hue using the argument split=True . Use our custom Pokemon color palette. Adjust the y-axis limits to end at 0. Place the legend to the right. We're going to conclude this tutorial with a few quick-fire data visualizations, just to give you a sense of what's possible with Seaborn. Heatmaps help you visualize matrix-like data. Histograms allow you to plot the distributions of numeric variables. Bar plots help you visualize the distributions of categorical variables. Factor plots make it easy to separate plots by categorical classes. Density plots display the distribution between two variables. Tip: Consider overlaying this with a scatter plot. Joint distribution plots combine information from scatter plots and histograms to give you detailed information for bi-variate distributions. Congratulations... you've made it to the end of this Python Seaborn tutorial! We've just concluded a tour of key Seaborn paradigms and showed you many examples along the way. Feel free to use this page along with the official Seaborn gallery as references for your projects going forward.